Shaista A. Husain M.D., F.A.C.S. (Houston) - Book Appointment Online! Please note if you are booking for a child please choose a time only after 2PM. Also only the patient is allowed in the clinic unless if the patient is a minor in which case the guardian is necessary to bring the patient in. 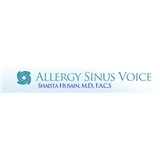 Allergy Sinus Voice is an ear, nose and throat specialty practice operated under the direct supervision of Shaista Husain, M.D. As an Otolaryngologist, head and neck specialist, Dr. Husain has developed the technical and clinical skills required in the diagnosis, treatment, and management of diseases and disorders of the head and neck. In her ENT practice, Dr. Husain spends about 50% of her time treating patients with sinus diseases, sleep apnea, and voice disorders. Many of her patients with chronic sinusitis, allergic rhinitis, and otitis media show signs of nasal allergies.